Four major discount department store chains are thriving despite (or perhaps because of) the recession. Kohl’s (NYSE: KSS), Kmart (NASDAQ: SHLD), Marshall’s (NYSE: TJX) and T.J. Maxx (NYSE: TJX) all showed gains in December 2008 sales per customer over both three month and twelve month periods. 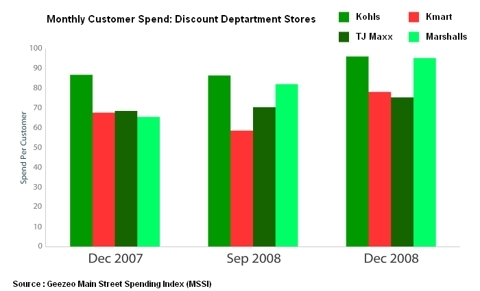 Marshall’s had the strongest performance in the group over the past twelve months, gaining 45% in customer spend per month from $65.41 in December 2007 to $95.15 in December 2008. It gained 16% from $81.98 in the three month period from September 2008 to December 2008. The strongest short term gainer was Kmart, which saw spending per customer increase 33% from $58.54 in September to $78.03 in December. It gained 15% from December 2007’s $67.63. Kohl’s registered an 11% gain as spending per customer grew from $86.69 the previous December and $86.35 in September to $95.94 in December 2008. The relative laggard in the group was T.J. Maxx, which saw spending per customer increase 7% from September’s $70.33 to $75.30. It had been at $68.47 in December 2007 - a gain of 9%. This data was reported by Geezeo’s Main Street Spending Index (MSSI). The strong performance of these chains was in direct contrast to weak sales for higher end department stores such as Macy’s (NYSE:M) and Nordstrom (NYSE:JWN).